The windswept steppes and arid desert of Inner Mongolia seem unlikely places to address China’s energy challenges. But these remote areas generate wind, solar and thermal energy that can be integrated into eastern China’s grid to meet the growing demand for electricity. While they’ve been largely untapped, due to the lack of transmission links to load centers that are thousands of kilometers away, this is set to change. These vast grasslands that have been home to nomadic people for centuries are the scenic backdrop for many large power transmission projects and now host the most powerful ultrahigh-voltage direct-current (UHVDC) transmission link in the world. The 1,628-kilometer (km) Ximeng-Taizhou UHVDC transmission link, developed by the State Grid Corporation of China, is now operational. It can transmit up to 10 gigawatt (GW) of electricity and has set a new world record in power capacity transmitted at 800 kilovolt direct current (kV DC) voltage level. ABB has delivered 509 megavolt ampere (MVA) converter transformers for the project, plus 800 kilovolt (kV)/6,250 ampere DC breakers and wall bushings, setting another world record in current capacity of bushings and DC breakers. China has major load centers in its eastern regions, while its energy resources are mainly in the west and northwest. The expansive geography and increased demand for electricity over the last decade have prompted the country to increase its UHV transmission capacity, enabling delivery of power from newer, more-efficient thermal power generation plants near energy reserves and renewable energies in remote areas, while lowering pollution near cities. 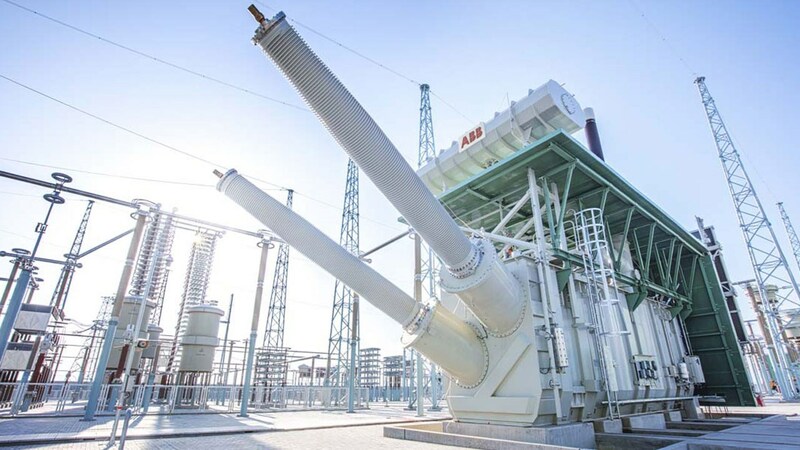 Recently ABB has also supplied transformers and DC breakers, wall bushings, with the same technology to the ±800 kV, 10 GW UHVDC Shanghaimiao-Shandong, and Jarud-Qingzhou projects, as well as 1,100 kV live tank circuit breakers to the Jarud-Qingzhou project, contributing to energy security as well as economic support and social development in China. Transformers are integral components of an electrical grid and essential for the efficient and safe conversion of electricity between diverse voltage systems. ABB’s transformer portfolio includes power transformers, dry and liquid distribution transformers, special application transformers and related services and components. As the world’s largest transformer manufacturer and service provider ABB has an unparalleled global installed base and a vast portfolio of power, distribution and special application transformers and is the partner of choice for enabling a stronger, smarter and greener grid.